What's the e-Lake festival ? e-Lake is an annual music festival. The festival takes place every second weekend of august at lake Echternach. e-Lake is a 3-day music festival (2015 even 4 days !) with foreign and local bands & DJs. The confirmed artists are ... see Line-up 2019 . The festival takes place on the weekend of 09-11 of august 2019. The festival starts on friday at 18:30 and closes sunday-night at 01:00. The adress is at the lake of Echternach, called Leisure Centre of Echternach (Centre récréatif d’Echternach) in Luxembourg. For your Navigation-System: Rue Grégoire Schouppe, L-6479 Echternach. 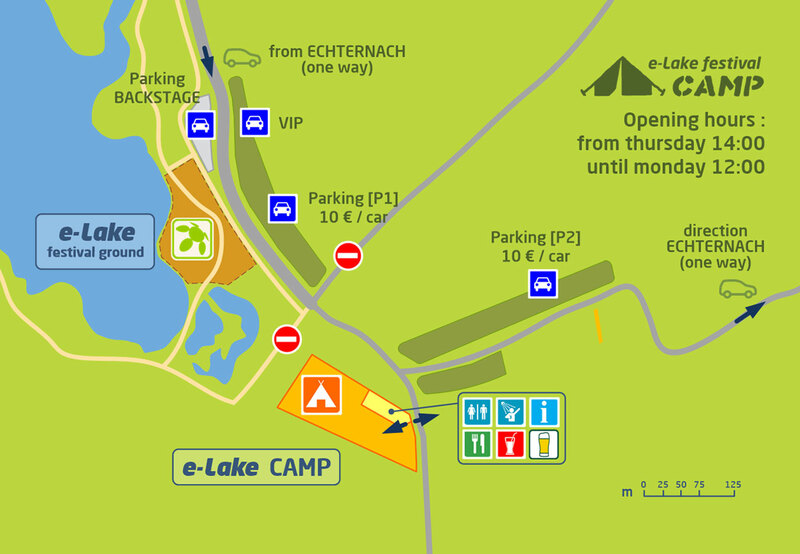 The campsite is open from THURSDAY (08 AUGUST) 14:00 until MONDAY (12 AUGUST) 12:00. 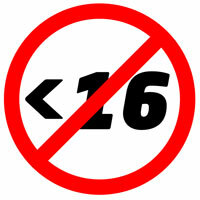 No unaccompanied under 16’s. Anyone under 16 must be accompanied by at least one parent. Please present appropriate identity documents on request. P+R Parking for free ! 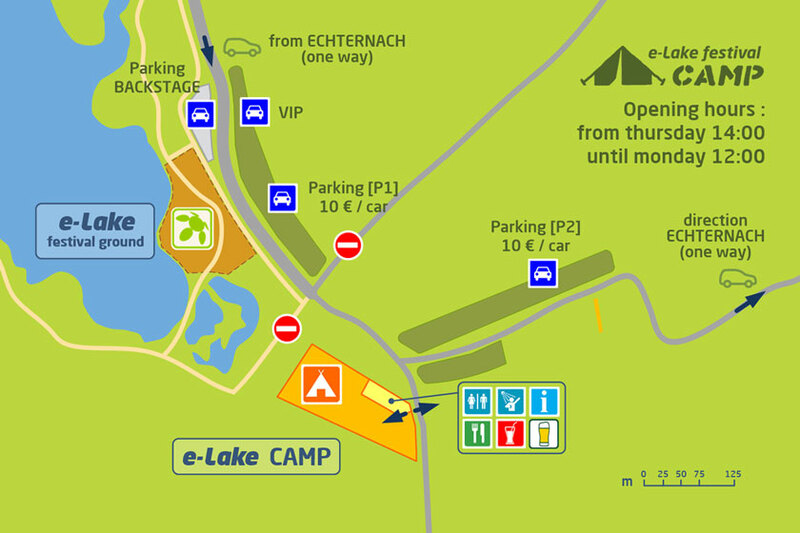 The e-Lake festival operates a Shuttle Bus Service between the car parking outside Echternach called "Zone Industrielle" and the Main Entrance of the lake, which is about 1,5 km from the festival-location (for more details, please check map below) . Please note: On site Parking (near venue) costs 10€ per car ! How to get there by bus ? 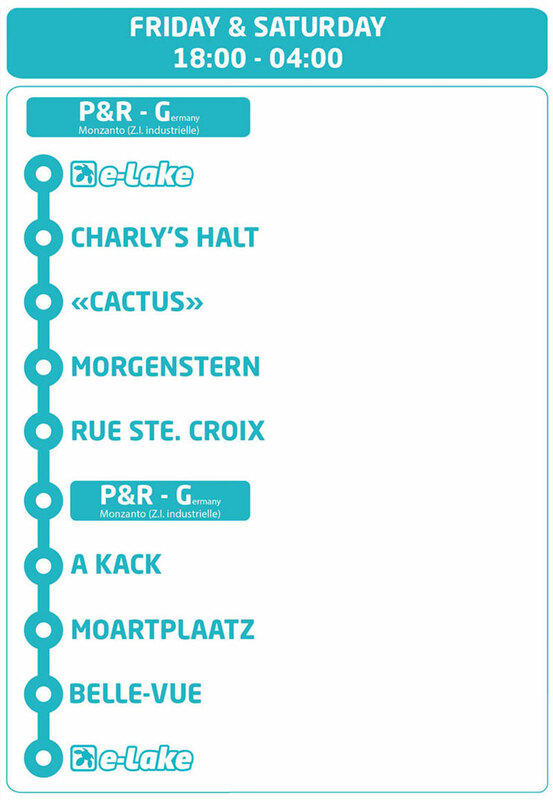 Note : The Bus-central-station is about 3,5 km from the festival-location. If you take the bus N°110 or N°112 you can leave the bus at the « Centre de secours »-station to get to the festival – it’s about 1,5 km from the festival-location. To get there by car, please check out Routing , Travelroute and P+R Shuttlebus . Please pay attention to the signs ! Note : at the entrance of the Parking-area, you have to pay 10,-€ / car. Please be prepared to pay this 10,- € per car, if you have to search for your money, you will probably cause a traffic jam. 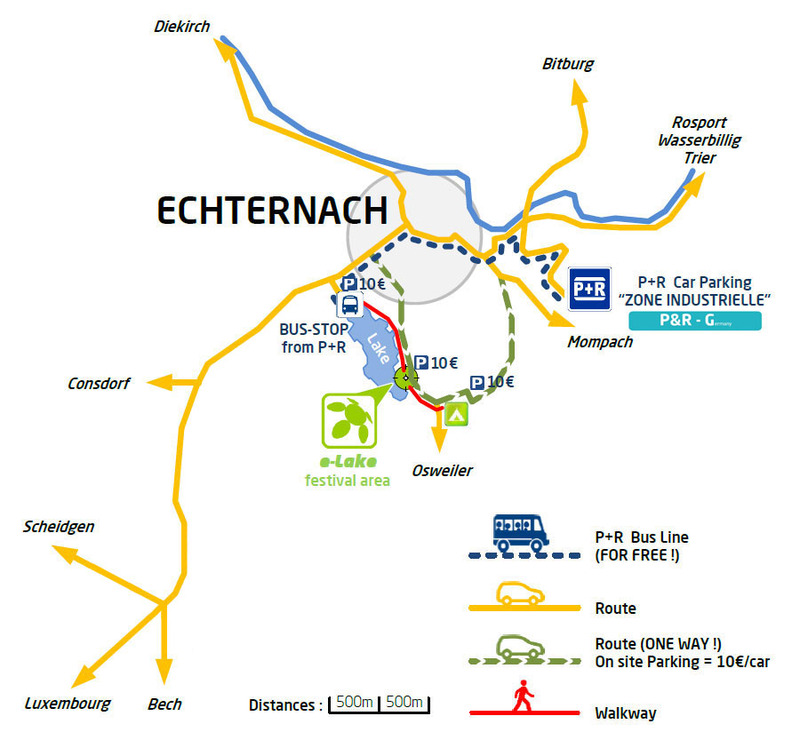 The e-Lake festival operates a Shuttle Bus Service between the two car parkings outside Echternach called "Zone Industrielle" and "ALRODESCHHAFF" and the Main Entrance of the lake, which is about 1,5 km from the festival-location (for more details, please check this map ) . The are enough parkings near the festival location for cars, caravans and bikes. At the entrance of the Parking-area, you have to pay 10,-€ / car. Please pay attention to the signs and follow the recommendations of the marshalls, otherwise you will cause a traffic jam. 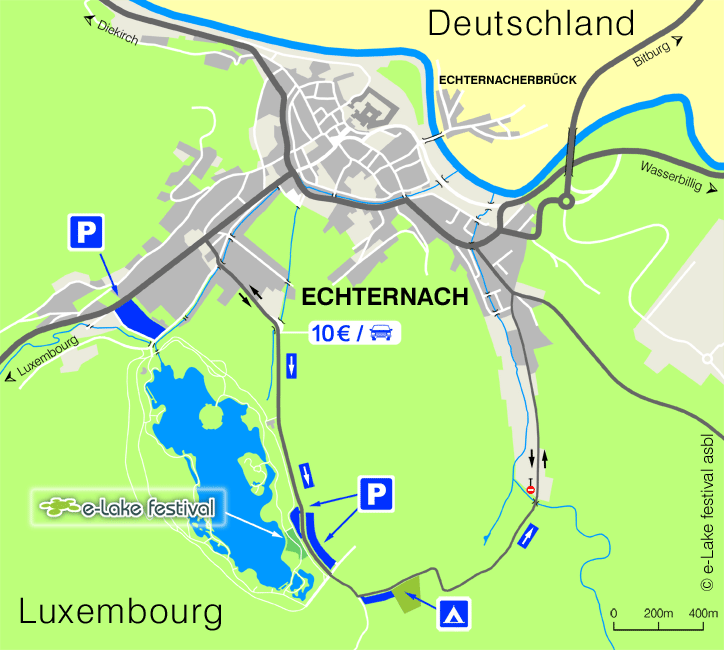 Check out: Map of ECHTERNACH . To avoid this, travel together and use car sharing or simply use pubilc transportation, Park&Ride or the festival Shuttlebus. Can I leave the festival and come back later ? Of course ! It’s a « FREE ENTRANCE » event with no fences or other barriers. Where can I camp ? Not permitted are furnishings such as sofas, armchairs, building material, bulky waste and fridges. Can I book my tent pitch in advance or make a reservation ? It is not possible and even not necessary to reserve the tent pitches on the CAMP . From experience of recent years there is sufficient space for all campers . Where can I charge my mobile phone ? The Enovos Charging Station gives you the opportunity to charge your mobile for free on the festival ground and camp . Open fires are forbidden, camping is not allowed in the forest, in the open countryside or at the border of the lake. Please respect the environment and keep the nature clean! Please keep the festival-area and the parking grounds clean. Please use the garbage pails! In order to resolve the problem of the massive waste production on the festival-area, the organizer founded the action group „e-Lake goes green“ two years ago. With the support of some partners, a „Recycling Center“ will be based on the event-site, and the visitors of the festival and those staying on the camping will be, with some different possibilities, excited to contribute to the reduction and separation of the upcoming waste (f. ex. : one free drink if you pick up 20 bowls). This will be done due to our and your responsibility to protect the green area next to the lake of Echternach as much as possible. Glas bottles and cans (tins) are not allowed on the festival ground. Sound / video / photo ? Sound and video recordings are forbidden. Only press photographers are permitted to use professional camera equipment, but pocket cameras are allowed. Press photographers have to ask the promoter to get an official Press accreditation . Are there things which are not allowed to bring with me ? Yes. No kind of bottles, cans, alcoholic drinks, animals, fourniture, drugs or similar, no weapons or anything that can cause harm to yourself or others. This list could be endless, we urge you to use common sense. It is not allowed to bring video cameras or equipment for recordings. It will be ok if you bring an ordinary pocket camera that can not be used for recordings, no digital or system cameras. There will be several kinds of food and beverage available. How do I pay for food and drinks ? To get any food or drinks you have to buy special coins (called OAPs) at the central cash-office. These coins have a value of 1,- € and are used as regular means of payment on the festival-ground. The cash-office accepts: cash, V-PAY, VISA, EUROCARD/MASTERCARD and MAESTRO. In addition to the ordinary Security-Team, there will be a Police office installed during the festival-days to survey and guarantee a smooth development of the festival. This Police Office (white office-container) will be placed between the Stage and the VIP-Parking. Medical ordely and first aid ? Near the Police office you will also find a First-Aid tent with medical orderly.